India has been consistently forg ing closer ties with African states since the India-Africa Forum Summit of taneously, there has been notice able emphasis on the eastern and october 2015. Simultaneously southern coastal states of the continent abutting the Indian ocean region. owing to the presence of the Indian diaspora in these countries for more than a century, India has been able to facilitate its politico-military, economic, commercial and cultural rapport in the region. This was evident when prime minister Narendra Modi visited South Africa, Mozambique, Tanzania, Kenya, Mauritius and Seychelles during the past few years. And immediately after assuming ofce last year, president Ram Nath Kovind paid state visits to Ethiopia and Djibouti. He visited Mauritius and madagascar from march 11 to 15. The visit to mauritius – where 70 percent of the population is of Indian origin – coincided with the country’s 50th anniversary of independence. India is offering Mauritius aid worth $353 million under a special economic package. during his visit, the president inaugurated the World Hindi Secretariat building in Port louis, built entirely with Indian fnancial assistance and laid the foundation stone for an ENT hospital. 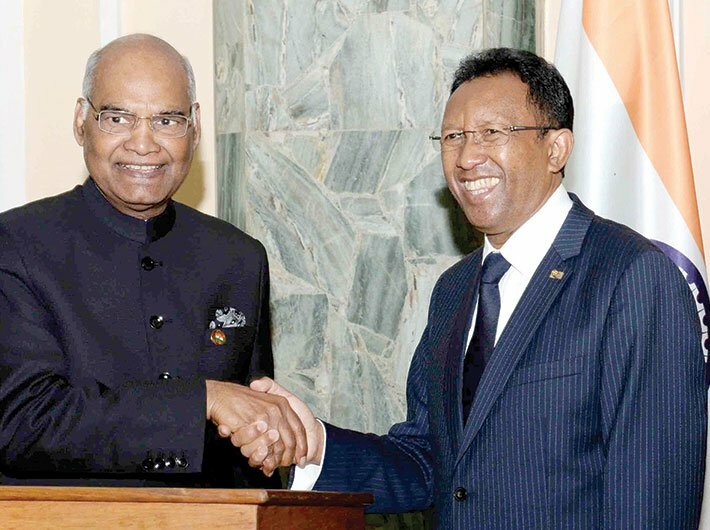 In Madagascar as the frst Indian president on an ofcial trip, Kovind was given the Grand cross of the Second class, the country’s highest award for a non-citizen. The award was conferred upon him by president Rakotoarimanana. Owing to their immense mineral and natural resources, as well as their geostrategic location on the Indian Ocean rim, the littoral states are critical for India in its ambition to maintain preeminent position in the Indian Ocean. However, China has already entered this arena by establishing a naval base and stationing an expeditionary force of the People’s liberation Army (PlA) in djibouti, in the horn of Africa. In the midst of growing Sino-Indian rivalry, east African littoral states, island states like Mauritius, Madagascar and Seychelles, as also the channel of mozambique, have acquired added importance in India’s strategic calculations. India already has defence cooperation agreements with Tanzania, Kenya, South Africa and Seychelles. In order to firm up its presence in the region, India has to be conversant with the domestic politics of all these countries. Unlike china, being a democracy, India cannot completely disregard considerations of human rights and democratic governance while forging ties with these African states. In this context, it can be instructive to shed light on developments in Tanzania, a geopolitically signifcant state endowed with immense mineral and natural resources, including gold, uranium, nickel, iron ore, copper, cobalt, natural gas and agricultural forestry. In fact, in 2016, India was a major trading partner and investor in Tanzania. During modi’s visit of 2016, India and Tanzania had signed fve agreements. India also had opened a line of credit worth $92 million to facilitate management of developmental projects in Tanzania. The growing stakes of India are evident in Tanzania through the presence of banks like Bank of India and Bank of Baroda and companies like Tata International Limited, Reliance Industries, Bharati Airtel, Godjrej, Kirloskar, and life Insurance corporation. Sadly, after John magufuli became president of Tanzania in November 2015, there’s a perceptible drift towards authoritarian populism. After seeking vote on the planks of anti-corruption, accountability, discipline and reduction in public expenditure, magufuli took erratic steps like fring employees on TV, sacking corrupt ofcials and removing 10,000 ghost workers from the civil services payroll. His slogans – like Hapa Kazi Tu (Only Work Here) – have prompted people to nickname him ‘tingatinga’, or bulldozer. Just to demonstrate independence and an anti-West stance, he marked out Acacia, a london-based gold-mining firm, as having an unpaid tax bill of $190 billion. This sent out signals that foreign investments may be unsafe under his regime. He has also been distrustful of Chinese investors on the grounds that they are diﬀerent from the Mao Zedong regime that helped build the Tazara railway line connecting Tanzania and Zambia in 1968-76 to facilitate liberation struggles against the white minority regimes in South Africa. After witnessing his populist strategies against corruption, neighbouring Kenyans have demanded that their president Uhuru Kenyatta act against corruption. Nevertheless, such overtly populist measures are incapable of hiding Tanzania’s steep slide towards dictatorship in the past few years. Magufuli’s coercive treatment of the opposition and his inability to handle the rising demand of Zanzibar to gain further autonomy from the mainland nation underscore a failure of consensual mechanisms that formed a basis to run post-colonial Tanzania. Ironically, immediately in the aftermath of independence, Tanzania had installed a one-party democracy under the socialist leadership of Julius Nyerere, famously known as Mwalimu (teacher) as well as ‘Baba Wa Taifa’, or Father of the Nation. By integrating the archipelago of Zanzibar intoTanzania in 1964, the Nyerere regime functioned on the basis of consensus by promoting harmony among diverse racial, ethnic and religious communities. Nyerere had even sent Tanzanian troops to overthrow dada Idi Amin’s repressive regime in uganda in 1978-79. Nyerere drew inspiration from leaders like Gandhi, Nehru and Mao, while building his emancipatory project. As a nationalist and a socialist, he relied on building ujamma villages to transform Tanzania. Ujamma means ‘extended family’. under such villages, the land would be the property of the nation and owned by community as a whole. By the mid-seventies, the socialist experiment in Tanzania had shown clear signs of failure. After a decade of protracted economic decline, Tanzania was constrained to launch an economic recovery programme under the World Bank and International monetary Fund (ImF) in 1986. Eventually, Tanzania opened up its economy in the 1990s. The open economy, a vibrant multi-party system and political stability allowed Tanzania to attract donors and investors as foreign direct investments grew at the rate of four percent of the GdP per year during the past decade and the economy grew at 6.5 percent on average per annum. Tanzania happens to be the third major recipient of aid from the West and the World Bank has increased its allocation to Tanzania this year by $500 million and sanctioned aid up to $2.4 billion. But no initiatives have been taken in Tanzania to protect constitutional democracy by limiting the overwhelming power of the presidential office. Unsurprisingly, Magufuli is the head of the state as well as the government. Currently, he is also the chairman of the ruling party – The Chama Cha Mapinduzi (CCM), or the Party of the Revolution – that has been controlling Tanzania for more than five decades. On taking office, Magufuli used his powers to appoint his associates in government ofces and the judiciary. Within the CCM, this has left little scope for dissent and undermined the party an institution. magufuli has been equally ruthless in handling opposition parties like the chameda (the Party of democracy) by enacting draconian cybercrime laws, denying media coverage to opposition, banning all political rallies and restricting the campaign of MPs to within their constituencies. Despotic measures like charging two opposition MPs of sedition and putting them in jail, banning TV broadcasts of parliamentary sessions, banning from the House MPs who express discontent, shutting down newspapers that are critical of ofcial policies, and crackdown on social media, especially the arrest of the owner of Jimi Forums on criminal charges have created a fear psychosis underpinned by extrajudicial violence. In addition, elections were annulled in Zanzibar in 2015 due to alleged rigging, violence and intimidation, and the Civic United Front (CUF), in spite of its victory, could not rule. This is problematic. muslims in Zanzibar, considered the gateway to east Africa, were by and large moderate, but now Arabfunded NGos are pushing radicalisation. (It was a Zanzibar-based Al Qaeda member who attacked the uSS cole in 2000.) Currently, Uamsho, an Islamic separatist/terrorist movement, and Al Shabaab, a Somalia-based group, are active in Zanzibar. Handling terror and evolving mechanisms to devolve power are going to be Magufuli’s challenges in Zanzibar. Obviously, it is going to be increasingly difficult to handle discontent in Tanzania if the regime deviates from democratic modes of governance and relies on repressive measures to govern. Under the circumstances, India has to protect its investments and interests while handling authoritarianism in Tanzania. Although it has to balance positive aspects like advantages of location, resources and agreement over issues such as combatting terror with dismal reality of erosion of democratic governance in Tanzania, India’s thrust towards East Africa will persist.